A team of UO students took second place in a national architecture competition focused on the use of wood as a sustainable material in building designs. The design by architecture students Greg Stacy, Benjamin Wright, Alex Kendle and Michael Meer was chosen from among entries submitted by more 850 students for the Timber in the City: Urban Habitats Competition in New York City. Titled “Hybrid Domains,” the design makes extensive use of timber in a way that evokes 19th century steel and iron loft buildings. 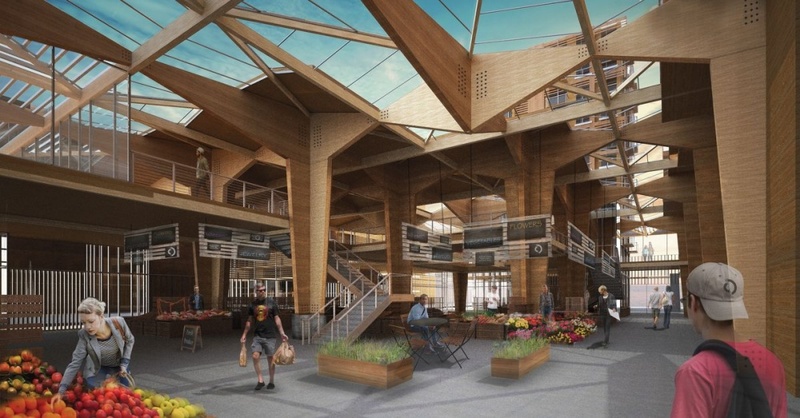 "Hybrid Domains had a very sophisticated approach to the integration of multiple mass timber structural systems with the three building typologies: museum, market and housing," said faculty advisor Judith Scheine, professor of architecture and department head. "The team took a complex project and handled all the parts with great skill, from the overall conception to the details. It's great that their work was recognized with this well-deserved award." The team earned $7,500 in prize money and $5,000 for faculty sponsors Scheine and Mark Donofrio of the UO and Mikhail Gershfeld of California State Polytechnic University. The object of the competition was to produce a design for a new midrise, mixed-use complex with affordable housing for a project on New York’s Lower East Side known as Essex Crossing, a once-blighted area undergoing redevelopment. The project includes a branch of the Andy Warhol Museum and a new home for the historic Essex Street Market. The competition was organized by the Association of Collegiate Schools of Architecture, Binational Softwood Lumber Council and Parsons The New School for Design. A panel of leading architects and professors awarded a total of $40,000 in prizes.